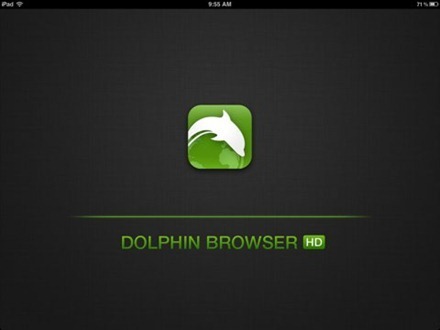 This week’s pick is Dolphin Browser HD – an excellent alternative browser for the iPad. Dolphin Browser is the world first Gesture and Webzine enabled browser for the iPhone. Fast and playful, you can train your Dolphin Browser to adapt to the way you want to browse the mobile web. Webzine. Fast loading, without ads; Webzine simplifies the way you read your favorite news, blogs and websites. Effortless Browsing. Dolphin Webzine displays web articles in an elegant format without distractions. Scroll through thumbnail images to open one of 120+ channel subscriptions and = tap on any thumbnail image open to the article. From Elle to Wired, Webzine brings the elegance back to reading on the web. Gesture. Let your inner artist out and create a personal symbol to access the websites you use the most. 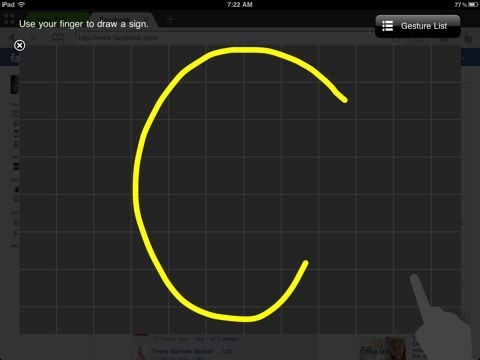 Use a “G” to reach Google.com, an “F” for Facebook.com or create your own. By just clicking on the gesture hand symbol on the menu bar, Dolphin Gesture enables you to open your favorite sites with just one stroke. Speed Dial. Visit you favorite sites on the go with one touch. No need to type out long URLs on tiny keyboards, simply input your favorite sites on Speed Dial and access them with one touch. SideBars. Make the best of mobile interface via Dolphin SideBar. No need to worry about limited interface on mobile device anymore. Swipe to the right and quickly launch the toolbar. 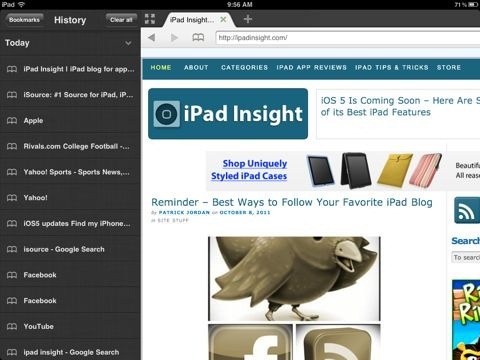 Swipe to the left and browse your bookmarks list, browsing history and folders. Desktop Mode. Can’t access a site in mobile? Easily switch to desktop view. With Dolphin, you can change your user agent from desktop to mobile view according to your needs. And that’s not even the full list – to say this app is feature-rich is a big understatement. 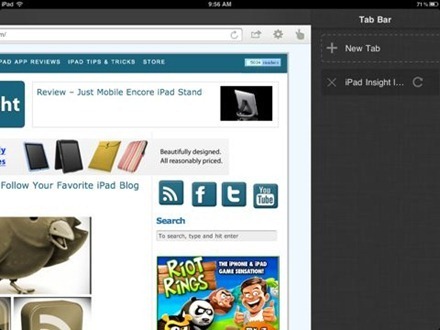 It also offers tabbed browsing with unlimited tabs and full screen browsing. What I like best about Dolphin Browser HD is that it’s packed with cool features and the UI is great, so all of those features are easy to use and comfortable to work with. I love the way the left and right sidebars work. You swipe right to reveal the left sidebar which gives you quick access to your bookmarks and history, and swipe left to show the right sidebar where you’ll see all open tabs and be able to tap to switch to any of them or tap to add a new one. Before trying them out, I thought the gestures were not something I’d use much – but I quite like them now and they work really well. Another nice little touch is that the app has a URL keyboard (with no spacebar, optimized for just entering a web address) and a default keyboard. 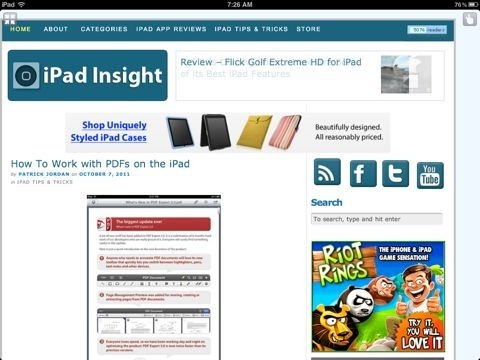 All in all this a very nice alternative browser for the iPad. One that genuinely adds something to the browsing experience on iPad. Here’s an App Store link for Dolphin Browser HD. yeah it really is cool, and much better than safari. but (!) safari is still the default browser, which means that when I open a link from my mail (or any other app, actually), it still goes to that lam safari, just when I got used to this cool Dolphin, is there a solution? I, too love this browser! I even use it on my Android phone and they have a mini version there too that’s more basic than the HD version and takes up less space. The only problem I’ve been having with it is in the webzine. When you get to the end you can’t see anything more of the article. I press the one button which seemed to work once, but every other article doesn’t show more of the article. Do you think this is something I should contact their support about? Yes, that definitely sounds worth talking to their support about.